In February 2013, the Adobe Product Security Incident Response Team (PSIRT) released security advisory APSA13-02. In that report they listed two vulnerabilities (CVE-2013-0640 and CVE-2013-0641) that were widely exploited. At McAffee Labs and McAfee Labs we ran some further analysis of these exploits and want to share some of the interesting details we discovered. Based on information from the PSIRT, both vulnerabilities will impact all versions of Adobe Reader from 9.x to 11.x. (Some Acrobat versions are also vulnerable.) We verified this claim and found the sample affected all of them. The exploit is spread by a malicious PDF file. When Reader opens the PDF file, it will trigger the vulnerability and start the exploit. This PDF file delivers a very complex attack, bypassing the current Adobe sandbox mechanism to launch the malware. 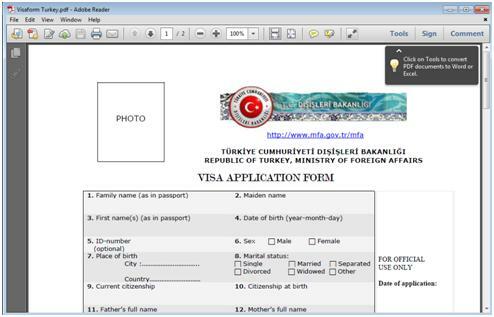 The new PDF, Visaform Turkey, will appear to hide the exploitation. The exploit uses a lot of memory in the background. The PDF’s first exploit uses a heap overflow to overwrite a virtual function pointer, and also uses a memory information leak to bypass the address space layout randomization (ASLR) protection in Windows. Return-oriented programming is used to bypass data execution prevention (DEP). Let’s sidetrack for a moment and look at two definitions: Return-oriented programming (ROP) is an exploit technique in which an attacker controls the call stack to indirectly execute arbitrary intended or unintended code to deliver an attack, thereby bypassing security features such as DEP. Stack pivoting is a common technique used by ROP-based exploits. Pointing the stack pointer to an attacker-owned buffer, such as the heap, will provide more flexibility for the attacker to carry out a complex ROP exploit. Here’s how the exploit works from the first trigger point. The vulnerability is in AcroForm.api. After the exploit prepares customized stack data on the heap, the data triggers the exploit via following instructions in AcroForm.api. With a modified virtual function pointer, the instruction calls into a special ROP gadget, which will start pivoting. It will repeat from stack 0x11849a34 to stack 0x1184beb4, a whopping 9,344 (0x2480) times! The next gadget will move the esp register to esi. It will control the stack itself. So the logic will write target memory with values in the ecx register. 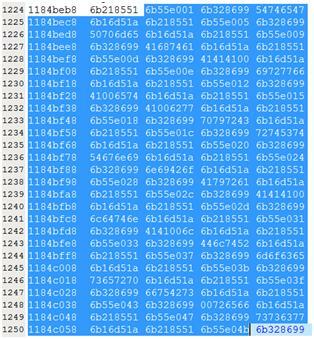 The same pattern will repeat many times to modify 0x6b55e001, which is the beginning of the data section of AcroForm.api. At this point, the stack keeps the parameter for LoadLibraryA(). This is actually a string for MSVCR100.dll in the “idata” section. Once the MSVCR100.dll handle is available via LoadLibraryA(), the following code writes the handle to the target address in the heap (actually the fake stack), which is used to call GetProcAddress() as the first parameter. The address is 0x1184c0e4. Next the process calls the following gadgets to get function pointers for the wcsstr function. The first parameter is a DLL handle received from previous gadgets. Now it’s time to call the function with the jmp eax gadget. Here the code searches for the string “MODULE” from the heap or the fake stack. There is a long string in the heap following the “MODULE” signature. This is the encoded and compressed DLL D.T. With more gadgets, the code calls CryptStringToBinaryA() to convert this string to binary, and then calls RtlDecompressBuffer() to decompress the binary to the real D.T binary code in memory. Similar ROP gadgets get ntdll.dll and related API addresses, for example, RtlDecompressBuffer() and CryptStringToBinaryA(). Finally, the ROP gadget calls GetTempPathA() to get the current temp path, the sandboxed path. It will create D.T under this path and call LoadLibraryA() to run the D.T. module. D.T creates two threads. One shows error messages. The second creates and loads the DLL L2P.T, which exploits the second vulnerability to load L2P.T into a nonsandboxed acrord32 process. Finally this process terminates. 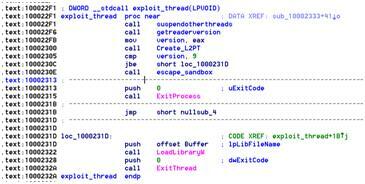 Due to a heap overflow, the eax register calls to the stack-pivoting ROP gadget. A few more ROP gadgets after stack pivoting load L2P.T in the same process. L2P.T creates another DLL, langbar.dll, which downloads the rest of the malware. After we reviewed all of the exploit code and corresponding ROP, we found that this exploit does not use any traditional shellcode. All API calls use the fake stack from the stack pivoting. Stack pivoting is a very common technique to allow an exploit to run powerful gadgets with a fake stack. For this kind of complex case, it’s very hard to create a customized stack within the real stack instead of within a fake stack. Once an exploit can do stack pivoting, it can bypass different defense mechanisms. Evolving security solutions need to address this attack pattern. Stack pivoting creates a very complex ROP attack and is a good example of how exploitation techniques continue to evolve. This successful exploit bypasses both Adobe client security features and basic Windows DEP and ASLR defenses. We thank our colleagues Haifei Li, Bing Sun, Xiaobo Chen, and Chong Xu for their help with this analysis.